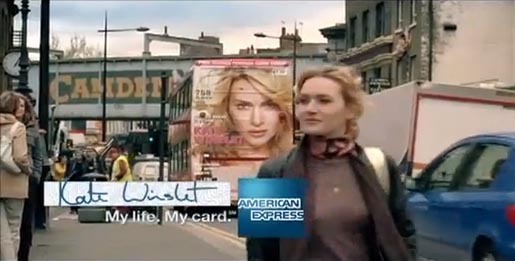 This time last year American Express continued its “My Life, My Card” series with English actor, Kate Winslet walking through Camden, London as she talks about her various movie roles. The ad was posted at www.mylifemycard.com, although it has now been replaced with more recent spots. The American Express television advert opens in London’s Camden Markets, slowly revealing Winslet as she meanders through the booths. As she peruses the vintage books, fresh fruit and children’s toys, mementos catch her eye that remind her of the many lives she has led through the multitude of characters she has played on the silver screen. We hear Winslet reflect on the incredible journey she has taken in film, and the most important role she will ever play — herself. “At 17, I went to prison for murder.” The camera focuses on iron bars, a reference to Heavenly Creatures. “By 19, I was penniless and heartbroken.” Winslet browses through a copy of Jane Austen’s Sense and Sensibility. “I almost drowned at 20.” Winslet crosses a bridge over Regents Canal, a reference to Titanic. “My mind started to go at 24.” The camera loses focus, coming back again to show Winslet remembering to pick up her coffee from the side of the bridge, a reference to Iris. “Then I had my memory erased at 28.” A van passes between Kate and the camera. A reference to Eternal Sunshine of the Spotless Mind. A range of images from the shot brings us back to the recovery of memories. “By 29, I was in Never Land.” Kate wanders through a toy stall, looks at a green hat, then picks up a hook in a bric a brac shop. “My real life doesn’t need any extra drama. That’s why my card is American Express.” Winslet is passed by a bus emblazoned with a womens magazine advertisement featuring Kate’s photograph. The Kate Winslet American Express ad was developed at Ogilvy & Mather New York by chief creative officer David Apicella, creative director Chris Mitton, art director Kate Wilentz, copywriter Jonathan Koffler, with agency producer Christine Lindemann. Music was produced by Karl Westman, senior partner and executive music producer for Ogilvy & Mather, New York. Filming was shot by director Roger Michell at Saville Productions, Los Angeles worked with director of photography Haris Zambarloukos and producer Alice Mintzer. Editor was Kim Bica at Lost Planet, New York. Post production was done at Nice Shoes, New York, by editor Rich Schreck and colorist Lez Rudge. Music was developed by Jason Lifton, at Pulse Music, New York. Sound Production was done at Sound Lounge, New York. In 1994 Winslet appeared in Peter Jackson’s New Zealand film, Heavenly Creatures. In 1995 she starred in Ang Lee’s Sense and Sensibility, the adaptation of Jane Austen’s novel. In 1997 she starred alongside Leonardo Di Caprio in Titanic. In 2001 she starred as the young Iris Murdoch. In 2004 she starred along with Jim Carrey in Eternal Sunshine of the Spotless Mind. In 2004 she starred alongside Johnny Depp in the Peter Pan movie, Finding Neverland. In May American Express Kate Winslet won a gold award at the 12th FCS Annual Portfolio Awards, “Best In Show in the Corporate Image category”. In April this year Advertising Women of New York announced the Good and the Ugly, counting Kate Winslet’s American Express Ad among the ‘Good’.